The little-known AAAA battery can be very useful indeed. It’s very small, and thus can be crammed into tight spaces. It’s nearly as compact as some of the larger lithium coin cells that you might reach for in a small project. However, it can still maintain the high current draw of a big alkaline dry cell, unlike the lithium chemistries. If you have a project where you need to draw 100+mA continuously, but space is tight, AAAA cells are just the thing. Some calculators, MP3 players, and remote controls also use these. While working on just such a project, I found myself needing four AAAA batteries. Then I looked at the price tag- yikes! At my local drugstore, the pack you see here is over $6. That’s about three bucks EACH. Highway robbery. So here’s the hack. I’m probably the last person on earth to figure this out, but guess what’s inside a standard rectangular 9V battery? Six(!) AAAA batteries. Yep, six. A pack of four 9V batteries at the same drugstore is $14. That’s 58 cents per AAAA battery, or a savings of about 80%. 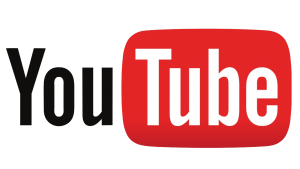 The rectangular outer shell is a thin metal wrapping that you can clip away with a small side cutter. The cells inside are easily separated, and even have handy tabs already attached if you want to incorporate them into a project. If you need them for an existing gadget, just yank the tabs off. The snap connectors from the top of the battery can also be salvaged for building 9V battery cases or installations in other projects. 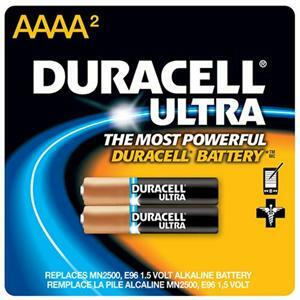 So there you go- next time you need a AAAA battery, buy the 9V on the shelf next to it instead and stick it to the man. Down with Big Battery! Hah! That’s a great tip on the A23. No wonder those things are so expensive. The cells in the 9V battery may be 4A in dimension and 1.5V, but are they of the same ampacity of the cells you buy that are labeled.packaged 4A? Most likely they are, but I never read of anyone determining that for a fact. Maybe it’s because that I live in the sticks, I never seen a package of 4A batteries or a device that requires them. I’d probably hate those devices more that I hate devices that require 3A. That’s a very good question, and I do not have the answer to it. I suppose a person could put a known load on one and see how long it takes to run down. That would give an idea if they’re the same cells, anyway. Well, there you go! I never even new there was such a thing as AAAA battery! I must try this out down under. Be aware, not all 9vlt use this system. I broke one apart once and found it had a pancake stack of rectangular batteries. I think it depends on the brand, and maybe the difference between alkaline and not. Interesting… as sariel mentions above, the A23 12V (and I believe 123 3V) camera batteries are just stacks of button cells. 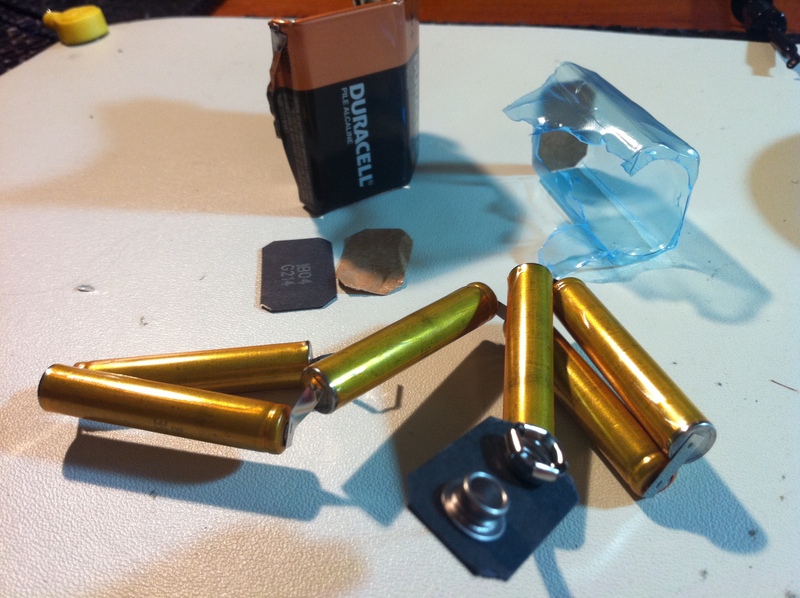 Perhaps the “lithium technology” 9V batteries from Energizer are constructed the same way. I can vouch for the stack of rectangular cells in some 9v battery brands. I recall that I found this to be the case with either Energizer or Duracell, think it was Energizer. I used this trick for a paintball marker modification I once did where I used the board from a Matrix in an Angel (which had a bad board). The Angel had had a Ni-MH battery pack in a metal tube, but the Matrix board ran off a 9v battery. I took off the 9v battery casing and unfolded the cells into two lines of three, which I was then able to stick in the original tube. The cylindrical cells found in 9 volt batteries are IEC number LR61. It’s basically the same as AAAA’s but not retail packaged. Capacities are identical. I checked the datasheets. Not much downside to disassembling a 9 volt except you should first check to be sure the brand uses cylindrical style cells. As you remove them out take note of the polarity as LR61’s may not be clearly marked. A hint…the negative end has a recessed rolled edge as seen in the picture, but not all makers do this. The 9 volt lithiums are interesting. They use three cells in series to get 9 volts. What they use are three 1/2AA cells laying down sideways over each other (1/2AA = CR14250). It should be stressed that not every 9 volt uses cylindrical AAAA’s. Some use the older pancakes style which are rectangular.